CarryonHarry Talk Show guest Brandy L Brown empowers us with the gospel tools of building Godly, quality relationships...whether between husband and wife, siblings, dating, parenting, etc. She wrote to us " I am the author of The Purpose Driven Wife...below is an excerpt from my website regarding the book..."
The Purpose Driven Wife, teaches the 21st Century wife what the Bible says about true submission, how to understand and relate to her husband, how to truly build her house as a wise woman should, how to capture her husband's heart, what keeps a husband happy and content with his own wife and NOT the strange woman, and it demonstrates how much power the Christian wife actually has in marriage! God gave US a husband to bring us Provision, Protection, a life Partner and Peace!! The enemy wants to pervert this! I am calling for 1 million saved wives to help raise the standard against him, by the spirit of God! 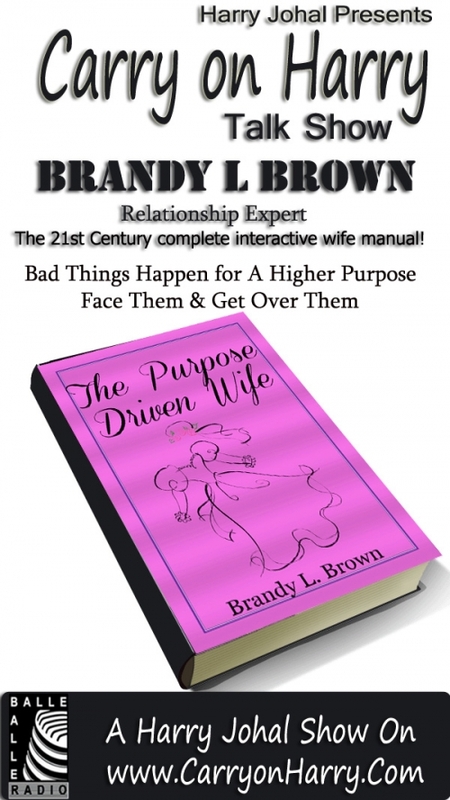 "The Purpose Driven Wife" is an interactive book, with questions (and spaces for you to place your answers) that will cause you to think about who you are in your marriage and how that either promotes oneness or hinders unity. " Talks with Brandy L Brown are now on Air .